In a previous post I described a way of creating hexagonal areas on maps automatically making it easier to show area maps using Tableau's HexBin functions. The original method creates automatic hexagons in LatLon coordinates but they become increasing elongated when plotted on the standard Mercator projections used in Tableau maps. It turns out there is a way to adjust for this that creates better-looking regular hexagons on maps (and also also make their actual geographic size more consistent). 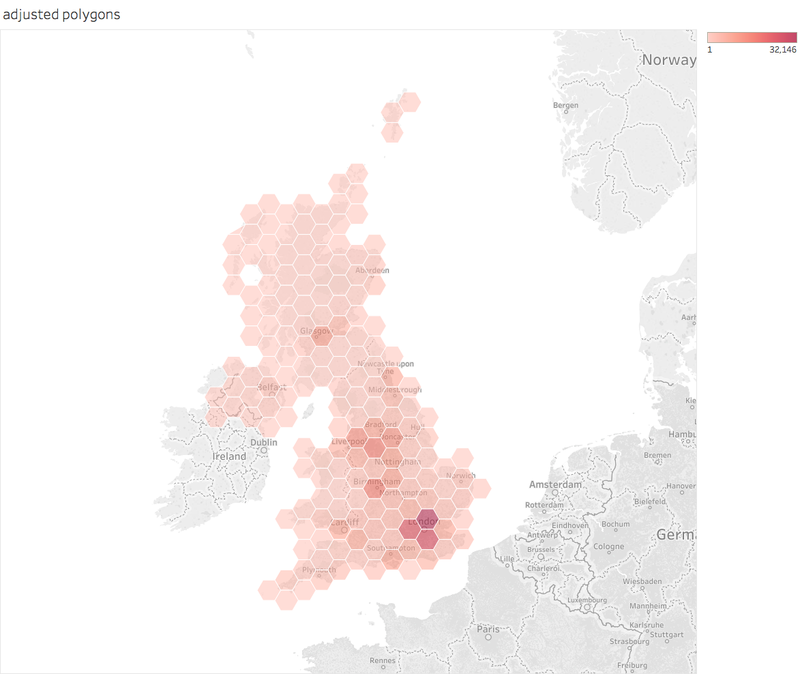 This post describes both ways of creating hexagonal regions from HexBins in Tableau. Note, I have also posted the essence of this in stackoverlfow.com. 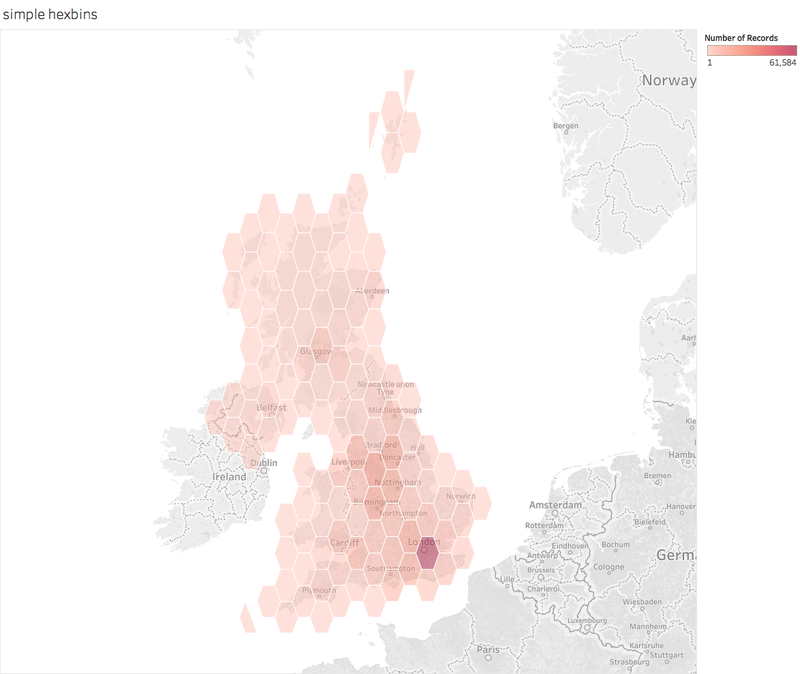 The hexbin function in Tableau works on any X-Y data to bin the raw coordinates into hexagonal areas. On maps, the data usually comes as Lat-Lon coordinates expressed in degrees. Tableau can plot this data directly but usually does this using the somewhat distorting Web Mercator projection (areas far away from the equator are greatly enlarged). This means that hexagonal bins defined on lat-lon will not be equally sized (one degree in an east-west direction represents a much smaller distance on the Earth's surface when the latitude is high and far from the equator but a degree on a north-south line is always about 111km long). Simple versions ignore this distortion and generate the hexbins from lat-lon coordinates. I'll describe methods based on this simple technique first. I'm basing this on a dataset containing the locations of every postcode in the UK (~2.5m rows with a wide range of density in different geographies). The hexbiny formula is similar. At this point the dataset should contain enough rows within each hexbin to guarantee that each hexbin contains rows with every value from 1-6 so all the points of the hexagon are defined. This shows that the basic technique works. But it also shows a key problem with it: the hexagonal polygons are distorted. If you can live with this (it is less of a problem close to the equator or over small areas) thens stick with it. But if you care about the distortions (the visual as well as the fact that the hexagons don't cover equal areas) then you have to do something more complex. What I describe below is based on work by Sarah Battersby of Tableau. You also need to add a parameter for the radius of the earth which is a conversion factor in the coordinate transformations. Note that it is the latitude formula that is the complex one. The extra part just adds a fixed distance to the coordinate for the hexbin centre based on a hexagon sized by the scaling factor (and there are six of these based on the six values of Angle). Now both the visual appearance and the actual size of the hexagons are better. For a Tableau Public workbook containing the above calculations see here. PS Tableau could and should build most of this functionality into the product as it would dramatically simplify a useful technique. PPS Although the visual appearance of the hexagons is now much better, the actual land area still depends on latitude meaning that the true area of each hexagon varies. According to Sarah Battersby's calculations areas the N/S extremes of the UK will be about 10% different from the areas in the centre. If you want the details of that calculation, check her Tableau page referenced below. Many of the ideas are based of the work of Sarah Battersby of Tableau Research. Some of her relevant talks are also available on the Tableau conference site here. And the original ideas were inspired by (but use slightly different techniques from) some posts by Alan Eldridge (the Last Data Bender) some of which are described on his blog here. Iam very happy after find this post. Thanks for sharing this Informative content. Well explained. Got to learn new things from your Blog. I like the way you describe this post. Its really helpful for the users of this site. I like your way of writing and explaining the topics.Thanks a lot really appreciate you sharing with us.Tableau Software provides software applications for fast analytical and rapid fire business intelligence. Tableau is one of the fastest evolving business intelligence and data visualization tool.If You Want More Details About Tableau Click here.